Bring a large pot of water to boil. Add a generous teaspoon of salt. Drop the prepared ravioli into the pan, stir gently and cook (without the lid) for about 1-2 minutes until they come to the surface. You can check one of your ravioli if the pasta is cooked enough, if not keep them in the water for another minute or so, otherwise remove them from the pot with a slotted spoon and arrange on a serving dish. In the meantime melt the butter in a pan, add the sage leaves and let the butter foam stirring occasionally. 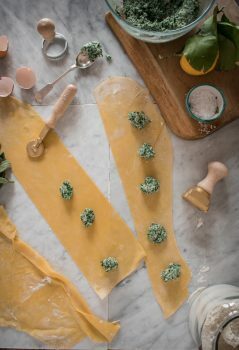 Once the butter becomes lightly golden pour it (with the sage leaves) over the ravioli and sprinkle with grated parmesan.